The John Joseph Moakley United States Courthouse in Seaport. As immigration authorities have stepped up their arrests of immigrants at courthouses, the effects have been chilling for defendants, victims, and witnesses, and trample on the constitutional rights of the accused, according to two lawsuits filed this week. Some immigrants who have cases in state courts are defaulting on judge’s orders, violating probation, or failing to receive court-ordered drug and mental health services because they are in ICE custody. Victims are afraid to seek relief and protection from the courts, and witnesses are reluctant to testify for fear of being picked up by ICE. “It’s basically saying to immigrants: ‘Stay away from the courthouse,’ ” said Rachel Rosenbloom, co-director of the Northeastern University School of Law Immigrant Justice Clinic. On Thursday, several civil rights groups asked the state’s highest court to forbid ICE from arresting people inside or near state courthouses. 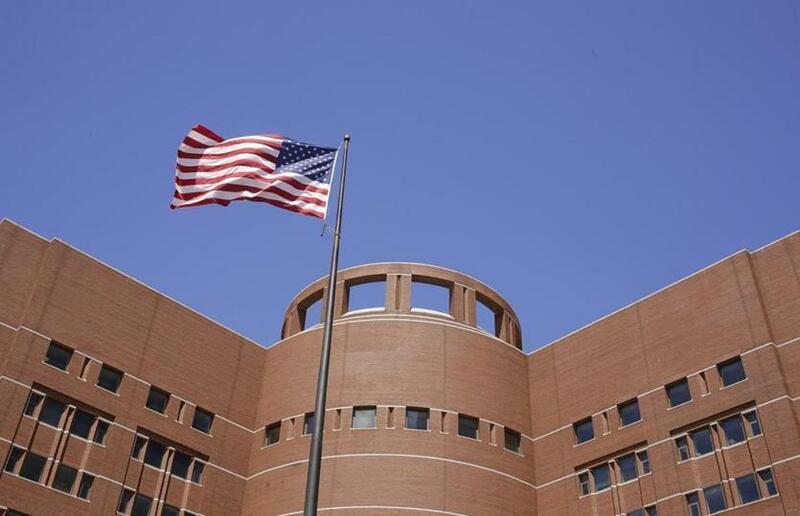 And on Monday, the ACLU of Massachusetts asked the federal courts to intervene on behalf of immigrants in ICE custody who are being prevented from attending state court proceedings despite orders by state judges that the detainees be brought to court. The suit by the Lawyers’ Committee for Civil Rights and Economic Justice, Committee for Public Counsel Services Immigration Impact Unit, and Greater Boston Legal Services was filed on behalf of seven noncitizens and argues that “access to justice in the Commonwealth is under siege.” It included a report by Northeastern’s Immigrant Justice Clinic that found that ICE arrests at courthouses are disrupting the state court systems. The plaintiffs, including a woman seeking guardianship of her disabled daughter, a tenant illegally evicted from her home, an assault victim, and a victim of domestic violence seeking a restraining order, are all too afraid to seek help from state courts out of fear they will be arrested and detained by ICE. “ICE is explicitly targeting sanctuary jurisdictions or jurisdictions that are more immigrant friendly,” he said. Those arrested include a soccer coach with a pending drunk driving charge, a woman ordered into a drug treatment program, and a man in the middle of a court-ordered competency evaluation. They have taken place at 24 court houses around the state. John Mohan, a spokesman for ICE, said in a statement that as a matter of policy the agency doesn’t comment on pending litigation. But in general, ICE’s practice of engaging in enforcement activities at courthouses is “wholly consistent with longstanding law enforcement practices nationwide” he said. Transferring an immigrant from ICE detention to a state court hearing is at the heart of the ACLU suit, which was argued in federal court Thursday before US District Judge Allison Burroughs. Samuel Pensamiento is a 26-year-old native of Guatemala arrested by ICE on Jan. 31 at Chelsea District Court as he left a preliminary hearing for two misdemeanor charges arising from a December traffic accident. He is married to a US citizen who is pregnant with their first child and was in the process of applying for legal permanent residency. Pensamiento is being held at the Plymouth County Correction Facility and ICE declined to transport him to a March 5 court date despite a state judge’s order to do so. The immigration judge won’t release him on bond because of the open case in Chelsea, and he risks not being able to resolve the state charges if doesn’t appear in court. “If Mr. Pensamiento is deported while these charges remain unresolved, then the mere pendency of the charges may permanently prevent him from obtaining a visa to enter the United States to reunite with his wife and child,” according to the suit. Pensamiento’s next court date is Monday, and his lawyers asked Burroughs to force ICE to honor the state court’s request. She did, stipulating that he be returned to Plymouth County Correction Facility at the conclusion of the court proceedings. Federal prosecutor Rayford Farquhar said the government’s fear was that Pensamiento would be released once he was taken to state court because of a recent ruling by the Supreme Judicial Court. In July, the state’s highest court ruled that law enforcement agencies, including court officers, don’t have the authority under Massachusetts law to comply with requests issued by ICE to detain someone who otherwise would be freed. McFadden and Lafaille assured the judge that would not happen. An earlier version of this story misspelled the name of ACLU lawyer Adriana Lafaille.